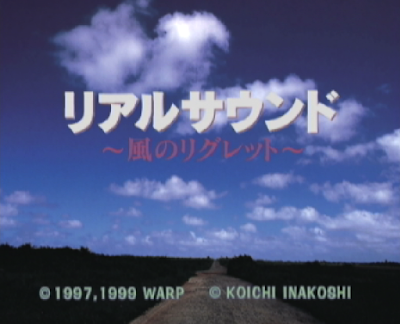 Winds of Regret actually started life on the Sega Saturn and was the brainchild of celebrated game designer Kenji Eno. The story goes that because Eno's previous games on the 32-bit Sega platform (D, Enemy Zero) were so well received by the blind community, he was bombarded with messages asking him to create a game specifically for the visually impaired. He obliged, and managed to persuade Sega to allow Warp to develop Winds of Regret, a sort of 'audio novel' in which players could choose their own path through the adventure at certain points with the aid of audio cues. Naturally, this game also found its way onto the Dreamcast in 1999 and this week I was lucky enough to procure a (factory sealed) copy from Genki Games. My ability to play the game is extremely limited due to the fact that I can't speak Japanese, but I am able to appreciate the concept and also the incredibly high production values afforded to the audio. Winds of Regret is like no other game I have ever experienced on the Dreamcast. There are very few visual aspects to the game and it takes the form of a sort of audio book crossed with a 'choose your own adventure,' and according to this website the story revolves around a young couple whose relationship stutters while they are school students. Years later, they are reunited - somewhat oddly - when something in the Tokyo subway system starts to murder/devour commuters seemingly at random. Typical Kenji Eno weirdness ensues and it's up to you to decide how the story unfolds and ultimately solve the mystery. This is a very loose interpretation of the story and it appears that there is a lot more to it than that...and to be totally honest I'm a little bummed out that I can't actually play the game/story, as it sounds freaking awesome to me. I'm a big fan of weirdness and urban horror, so this would be right up my street...if only I could speak Japanese. Those Linguaphone CDs suddenly seem quite appealing. Anyway, in absence of me being able to play Winds of Regret, let us turn our attention to the game's packaging. It comes in a double GD set, and the box is contained inside a perspex sleeve (with spine card) with clouds printed on it. The clouds motif continues inside the case with the set of cards that replaces the usual manual, all of which have a different cloud formation on one side and (I presume) instructions for the game on the other. Things take a turn for the strange though, as in the back section of the case you will find a small packet of plant seeds. Seeing as this game was released in 1999, I do doubt whether these seeds would actually germinate if I planted them now in 2015, but I'm going to try anyway (watch this space for an update on this!). Also inside the case is an instruction card written in braille, which makes sense when you consider the target audience. It really is a lovely set, and even though I cannot play the game as such, I can totally appreciate the excellent production values of the audio quality, the voice acting and the musical interludes. Perhaps the most interesting bonus item Winds of Regret offers for the western gamer though, is the D2 Shock demo disk. D2 Shock is a Japan-only preview of Warp's other Dreamcast game, D2. 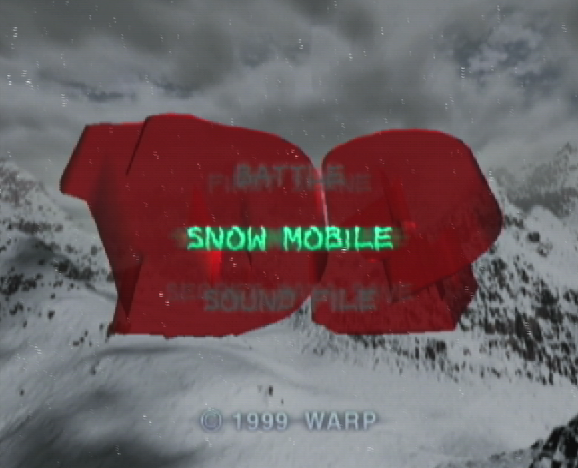 However, rather than simply be a demo of the first section of Laura Parton's snowbound horror tale, D2 Shock is more like a collection of exclusive mini games and bonus features that only people who bought Winds of Regret would ever get to experience. One particularly nice bonus contained on the D2 Shock GD is the save file that can be downloaded to a VMU and then used in the NTSC-J retail release of D2 to access a secret video file documenting the game's earlier spell as a Panasonic M2 exclusive. Other highlights include a snowmobile game in which you must race around an pseudo open world variant of D2's opening location to find differently coloured traffic cones; and another demo section called Battle, where you battle a mutated flight attendant in the remains of a downed airliner. As well as these fully playable demos, you can also access music files and movies detailing the intro and opening scene of the final D2 release. It's a great extra and a truly fascinating addition to an already intriguing package. Can I play Winds of Regret? No. No I cannot. But I paid £10 for this insight into the genius of a man, a creative mind and a game developer who is as legendary as his impressive body of work. The world lost a true visionary when Kenji Eno passed, and while his later productions hardly reached the same heady heights as the earlier Warp titles, it is ideas like those seen in Winds of Regret that will forever cement his place amongst the true legends of the video games industry. I feel a special mention must also go the Genki Games, the online retailer from whom I acquired this mint condittion, factory sealed copy of Winds of Regret. Genki are primarily a seller of Japanese games, hardware and merchandise and I usually buy my Neo-Geo CD games from them as they are one of the the most reasonably priced stores anywhere online for that system. But with this purchase (which also included King of Fighters '95 for the aforementioned SNK system), it really dawned on me that Genki offers such outstanding value for money and exceptional service that they deserve a shout out. They haven't asked me to write this, but the speed with which games are delivered, and the way that they are individually wrapped in plastic wallets really should be applauded. Not only this, but the customer service is outstanding. If you're looking for NTSC-J games or hardware of any denomination, please consider checking Genki's online store and supporting this small independent retailer. I guarantee you will not be disappointed. I think I have the same demo - is it volume 4 of the magazine demos? In a cardboard sleeve with Laura's face on the front? I've just tried it and it's different. Just has a movie and the opening section. No snowmobile section or battle mode etc. cool write-up Tom. I've always been interested in this because, well, Warp - but always bummed that I wouldn't be able to understand the story. After skimming through your article I was prompted to watch a play through of the game on YouTube. The music and voice acting is really sound. The voice acting in particular feels top notch. I think Real Sound: Winds of Regret based on the story could work well as a survival horror or open world game in the style of d2. Is this the same genki that ported virtua fighter 3 to the dreamcast ? Thanks for all your comments people! The Genki mentioned in the article is totally unrelated to the developer. I own both Sega Saturn and Dreamcast copies of this game and have tracked down the audio drama version which aired on Japanese radio back in the day as well.